Printed Words: Why I Absolutely Loved "Nevermoor"
Why I Absolutely Loved "Nevermoor"
If you want to read any Middle Grade novel this year, (before the year comes to an end eeeppp), Nevermoor is the one to dive into. Any fantasy novel that draws me in, is one with a vivid and expansive world, that encompasses various elements to make it believable. I felt like I was transported into Nevermoor with Morrigan and really, truly wanted to be there. There is a magic in Nevermoor that escapes from the pages purely just by reading about Nevermoor and its history and the city’s make up. Townsend has created a intricate and exciting world that, much like Narnia and Hogwarts/Hogsmeade, you can’t help but want these places to exist so that you can be there as well. Nevermoor carries the tone of a Middle Grade novel but has layers that have built a strong story line. It was straightforward enough to understand for any reader, but kept up the suspense and plot twists to keep me entertained and engaged. It was quite exciting really, between the trials and Morrigan’s integration into Nevermoor. I liked the pacing and am really glad that this is pretty much an all-age read. Nevermoor is Jessica Townsend’s debut novel and already her first piece has been such a strong and admirable read. Townsend’s writing delivers a strong world and solid plot that has me anticipating not only the sequel to Nevermoor, but her future works. She’s made me remember why I absolutely love reading Middle Grade to this day. There’s a kind of emotion attached to it, like I’m reliving my childhood, going through the kiddish excitement from reading about a magical adventure and experiencing the feeling of really being there. 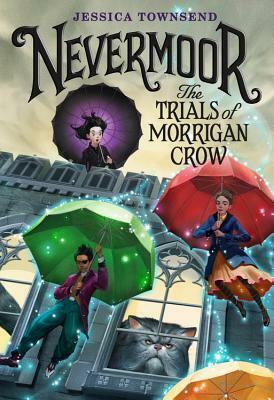 Nevermoor is a win for all ages and I cannot wait to continue this adventure with Morrigan.